You might think the thing you would be most nervous about before your professional debut would be the game. Turns out you are wrong. 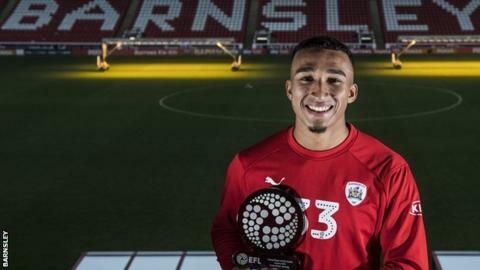 "I was buzzing when the gaffer told me I was going to be on the bench but I was a bit scared because it was an away game so I knew I was going to have to sing in front of everyone," Barnsley forward Jacob Brown told BBC Sport. "I did 'I Need You Tonight' by Professor Green and in my head I knew all the words but when I got up there I forgot everything." Although a future career in singing does not seem to beckon for the 20-year-old, he is certainly making a big impression in his day job. Brown, the winner of the EFL's Young Player of the Month for January after scoring once and claiming five assists, has played a big role as the South Yorkshire side look to make an immediate return to the Championship. "Just having the run of games gave me a lot of confidence and the gaffer helped me with that too," he added. "Scoring my first goal at Oakwell in a Yorkshire derby (the 3-0 win over Bradford) was quality, I've been dreaming of that moment for a long time. All my family were buzzing for me." Daniel Stendel's men are unbeaten in the league since 8 December, a run which has seen them go second in League One. After Coventry, the Oakwell side have the second youngest average age in the third tier at 24 years and 117 days, and Brown believes the squad's togetherness has been key to their success this season. "With everyone being a similar age we all get along together and, even though we're a youthful team, a lot of the lads are really experienced," he said. "We do quite a lot of team bonding and things off the pitch, the other week we did Laser Quest and we did the Ninja Warrior course a few months ago. "Me and Dimi (Cavare) were probably the better ones. Everyone was really competitive, especially the gaffer because he hates losing!" Brown's experiences this campaign are a stark contrast to his time with Chesterfield last season. Loaned to the struggling League Two side in January, he failed to score in 13 appearances as the Spireites suffered a second successive relegation to drop out of the Football League. "It was an eye-opener for me. We had a lot of meetings when I was there about how people would lose their jobs if we went down and you just want to do all you can, but unfortunately we went down," he said. "It was devastating really. When you go you think you have the chance to become a hero and help keep them up, then you feel gutted when you can't do that." With the Tykes two points ahead of third-placed Sunderland in the table, Brown believes they are capable of handling the pressure in the remaining 12 games of the campaign. "There is a lot of pressure but from the start of the season it's been what we've wanted so we just need to keep doing what we're doing and winning games," he said. If Barnsley are to secure promotion back to the second tier, they will need to do so without top scorer Kieffer Moore after he was ruled out for the rest of the season on medical advice. Brown believes the team can use the absence of the 16-goal striker to motivate them across the rest of the season. "It's a massive blow because of the amount of goals he's scored and how he helps the team. We've had other injuries this season and other players have stepped up and show we have a quality squad," he said. "The most important thing is that we go up and we want to do it for ourselves and for Kieffer as well."